In 1994, I experienced using an internet browser for the very first time. 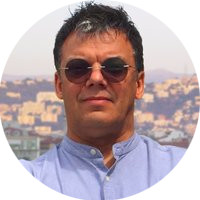 I was already familiar with the concept of connected computers, having previous knowledge of the JANET education network, and various flavours of Local Area Networks such as Apple LocalTalk and Ethernet during the mid 80’s when I was a college technician. It was during that period that I learned how to create disk-based interactive applications that were specifically designed for screen rather than paper. 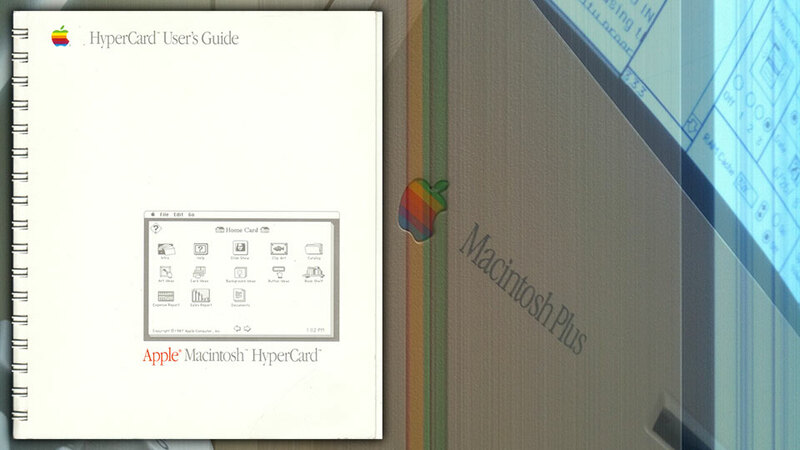 My first introduction into the world of interaction design was through Hypercard – a bitmapped multimedia authoring suite which was bundled with the iconic Apple Macintosh Computer. I become adept at designing simple black and white bitmap graphics that would eventually lead to publication of the UK’s first computer generated comic strip in Sound on Sound magazine. My enthusiasm for ‘all things Macintosh’ resulted in a groundbreaking gig as an Apple Product Demonstrator at IPEX88, where, among other things, I learned how to use modems to transfer print files from studio to commercial printers. By 1992, in a design support role with the KRCS AppleCentre Group, I encountered coffin-sized Farallon comms-cabinets, kilostream file-transfer and AppleLink email messages. Although the benefits of networked computers were well known to me, the user experience was less than intuitive, requiring command-line code that was easily mistyped, resulting in failure and obscure error messages. In 1994, trade publications like .net started to appear on the newsstands in what felt like a repeat of the home computer boom of the early nineteen-eighties. Some included a cover-mounted CD-ROM containing demo software. This was how I received a copy of the Mosaic internet web browser. What was amazing about Mosaic was that it blended the experience of reading a book with multilinear navigation and connectivity in a way that was completely ubiquitous. I knew this was something special and started reading about the internet. Publishing websites looked exciting but dedicated authoring software was not yet available and it was necessary to learn how to write HTML using little more than a text editor. With a £10-a-month Demon Internet dial-up subscription you could upload text and images to a shared web-space. All of this was achieved with a standard telephone line, a 28.8k modem and a monthly telephone bill that was about fifty times more expensive than normal as web access was charged at BT’s standard call rate. Eventually, fixed-fee internet access became the norm and the web authoring process became much simplified with the introduction of software such as PageMill and Dreamweaver though initially, the authoring process involved a steep learning curve which is where XPOhaas came in. Conceived as an online journal, XPOhaas was built at the end of 1994 and went live in the first quarter of 1995. My first web-page featured an image of an etching by German Expressionist, Ernst Ludwig Kirchner along with an inspirational quotation. What followed was a steady flow of journal entries, art reviews and material culled from art-school notebooks – you could call it an early blog – although there was no such thing at this time – and like many so-called ‘Webmasters,’ I used the web-space to experiment with this new medium, to break things and see which things worked. I’m still rather fond of the ‘imagemap’ on the home-page which features a bookcase, a diary, a painting, a lightbulb and a desktop card index, linking to various sections of the site – Metaphorical navigation, added with the launch of Netscape Navigator version 2.0, shortly before migrating the site to the Geocities online community. Hosting on Geocities allowed me to engage in Internet Relay Chat (IRC), which was almost entirely populated by American undergraduates. The platform was based around the concept of themed neighbourhoods where you could set up an address. 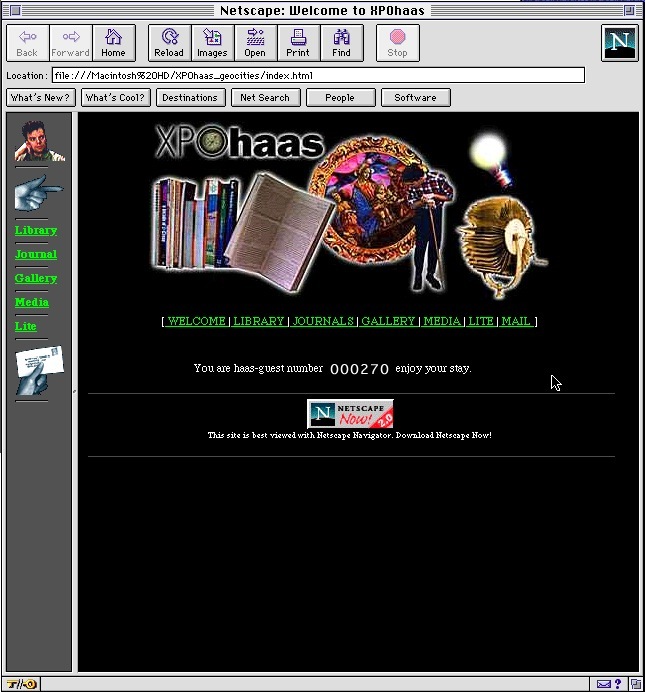 XPOhaas was located in SoHo on account of its creative content but was finally taken offline in 1999 after Geocities was acquired by Yahoo – A cautionary tale about what can happen to your precious assets when the hosting platform becomes outdated or uneconomic. Between 1998 and 2011, much of my professional activity involved the design of eCommerce websites, whilst experimental work continued under the Dreamtargets.com domain. In 2012, Dreamtargets took a back seat with the launch of my own digital design consultancy – Thinkamigo – Founded in order to engage in funded digital R&D projects in the creative space, with special emphasis on local heritage, literature and community outreach. Twenty years after XPOhaas disappeared from our screens, the content is being restored for a modern web audience. With so much of our online engagement curated and commoditised via social media platforms, I thought it might be interesting to recreate some of the essays here. Free from algorithms and contextual aggregation, XPOhaas runs contrary to the Orwellian dystopia that today’s internet has become.